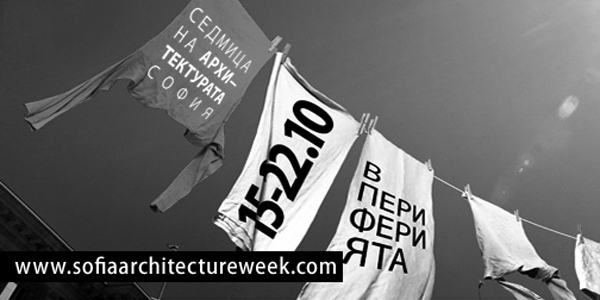 Sofia Architecture Week 2010, the third annual international architectural exhibition and forum in Sofia, Bulgaria, from October 15-22. The theme of this year’s exhibition is Periphery, and will include work and presentations concerning peripheral environments throughout the EU and around the world, including Estonia, Albania, Austria, Bulgaria, and Roma and Sinti communities in Eastern Europe. AGENCY will present Nation Building Aesthetics, research and design proposals for the developing nation of Albania, as part of SAW 2010′s Open House, curated by fordewind architects (Ephgenia Hodkevich and Boris Enev). Ersela Kripa (Principal, AGENCY) and Stephen Mueller (Principal, AGENCY) will also participate in a roundtable discussion with scheduled special guests Edi Rama (Mayor of Tirana, Albania, and World Mayor 2004), and Dritan Shutina (Executive Director of Co-PLAN, Habitat Development Institute) on October 19. SAW 2010 will also include workshops, concerts, discussions and presentations throughout the week. We look forward to seeing you there.